Over the span of the last three centuries, the ancestors of James T. McAfee, Jr., relentlessly sought for a life that could make a difference. Toward the middle of the seventeenth century, the McAfees left conflict-torn Scotland, and migrated to Ireland. Once in Ireland, extreme hunger and poverty gave them urgent reason to risk voyage across the violent North Atlantic to the New World. Undeterred, they trekked from Delaware to Virginia, pioneered west into the unknown bluegrass of Kentucky alongside Daniel Boone, and finally, at the turn of the twentieth century, this weary clan settled next to the Mississippi River in the rich, alluvial soil of Western Tennessee. A propitious moment had arrived. Success requires the relentless yearning and courage of countless generations for a family to reach a culminating moment of great contribution and distinction. With the birth of James T. McAfee, Jr., in 1939, such fulfillment coalesced. 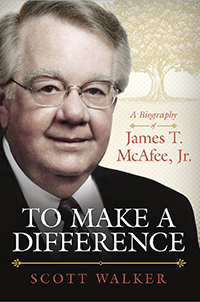 Over the span of the next six decades, Jim McAfee emerges as a significant leader within the healthcare industry, as well as a generous and visionary contributor to higher education. Drawing on family memoirs and a cache of personal interviews, Scott Walker recounts the career of Jim McAfee, and the impact of his life on Belmont University, Mercer University, and Union University.